A first-of-its-kind module—the Bigelow Expandable Activity Module (BEAM)—was attached to the International Space Station (ISS) this morning after the robotic Canadarm2 removed it from the trunk of SpaceX’s Dragon cargo ship. BEAM was successfully attached at 4:36 a.m. CDT (09:36 GMT) while the outpost was flying 250 miles (402 kilometers) over the Pacific Ocean. “The first human-rated expandable structure to be flown in space, now attached to the International Space Station,” said Dan Huot, NASA public affairs officer. 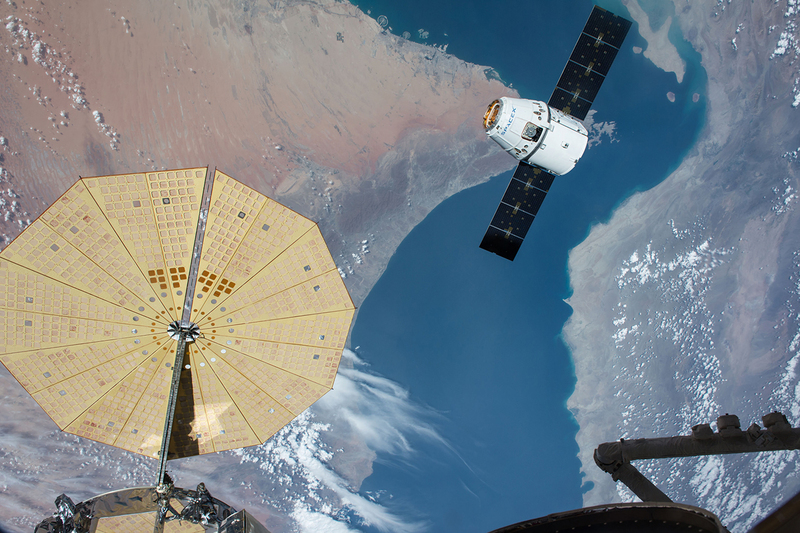 The process began just after midnight CDT (05:00 GMT) when ground teams commanded the station’s robotic arm to grapple BEAM inside Dragon’s trunk. It was then carefully extracted and moved to a pre-berth position near the Tranquility module. Tranquility’s aft Common Berthing Mechanism (CBM) petals were opened on Friday evening, exposing the four berthing latches. An inspection was done to ensure that everything was ready to receive BEAM. This is the first time that this particular port has been used in space. Once BEAM was in the ready-to-latch position, only inches from the CBM, Expedition 47 Flight Engineer Jeff Williams commanded the closure of the four latches, marking the first stage in the capture process. The robotic arm was then commanded into limp-mode, allowing the module to move a bit while being pulled in during the second stage of capture. After it was confirmed to be fully attached, Canadarm2 was commanded to disconnect and move away from BEAM. The expansion of the module will occur in late May after both Cygnus and Dragon have departed the station. It will occur in stages, beginning with the crew sending some atmosphere into BEAM using the Pressure Equalization Valve on the hatch. After that, canisters on board the Bigelow module will finish the process. BEAM is 3,000 pounds (1,360 kilograms) and has pre-expanded dimensions of 8 feet (2.4 meters) in diameter and 5.5 feet (1.7 meters) in length. That will increase to 10.5 feet (3.2 meters) in diameter and 13 feet (4 meters) in length. Crews will open the hatch and take temperature, pressure, and radiation readings about a week after full expansion. Additionally, the crew will install battery-powered sensors inside the module. 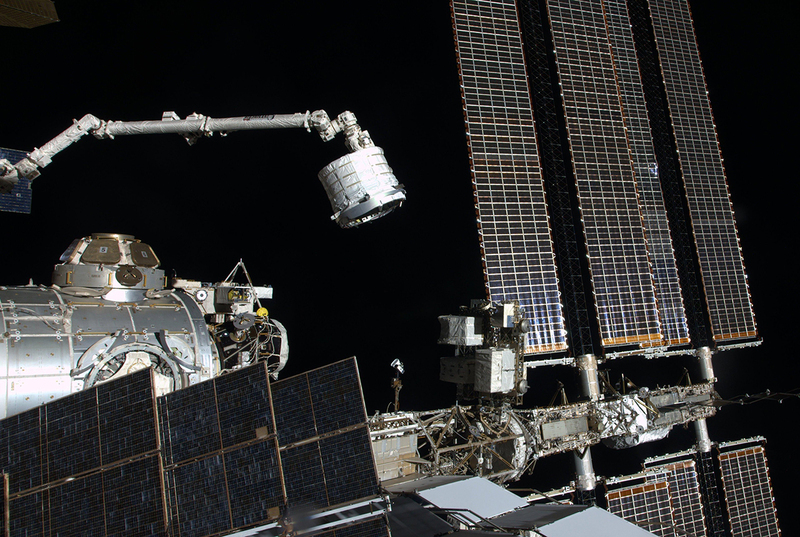 BEAM will remain unoccupied by crews throughout most of its two-year stay aboard the outpost. At the end of its stay on the space station, BEAM will be removed by Canadarm2 and released below the ISS. It will slowly move away from the outpost due to orbital mechanics. Its orbit will eventually decay enough for it to burn up in the atmosphere—expected about a year after leaving the vicinity of the laboratory. BEAM was developed under a $17.8 million contract signed by NASA and Bigelow Aerospace in 2012. The goal is to understand how expandable modules expand, how well they shield from radiation, and how well its long-term leak performance is. This is the third structure that Bigelow Aerospace has seen placed into orbit. The first two, Genesis 1 and 2, which launched in 2006 and 2007 respectively, determined long-term endurance of the technology. The two vehicles are still in orbit. The company’s next plan is to send two much larger modules to space—the 11,650 cubic-foot (330 cubic-meter) B330—by 2020 via a United Launch Alliance Atlas V rocket. Each is designed to be a stand-alone space station. However, during a press conference April 11 at the 32nd Space Symposium in Colorado Springs, Colorado, the company’s CEO, Robert Bigelow, said that he would like to see one of those modules dock with the ISS. It is unclear what, if any, discussions Bigelow has had with NASA about his proposal.